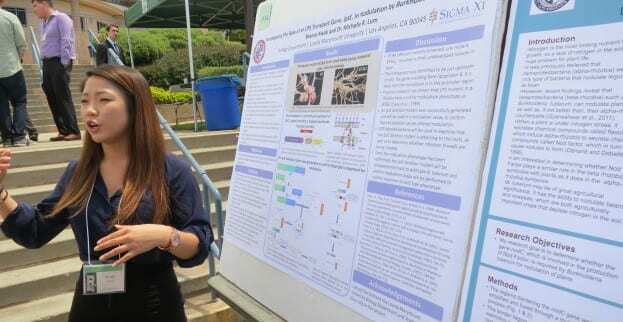 LMU biology major Brandy Kwak received the best poster award at the West Coast Biological Sciences Undergraduate Research Conference in Point Loma in April. The prize marked the second trip to the winner’s podium for Kwak. She won the best poster award at the 2014 conference as well. Now heading into her senior year, Kwak hopes to polish her research, which is on genes necessary for plant growth, and submit it for publication. She launched the project, under the guidance of Michelle Lum, assistant professor of biology, after her freshman year at LMU. Initially, the goal of the project was to identify genes necessary for plant growth. Kwak ended up identifying a gene mutation that was important for symbiosis (an interaction between two species, such as plants and bacteria) and began investigating the mutation’s role. The research has potential implications in agriculture to improve crop yields. It even has potential in human health by illuminating how pathogenic bacteria infect humans. That passion is a product of the Lum Lab, where Kwak spent many hours, she says. The opportunity to perform undergraduate research led Kwak to choose LMU for college, and she credits the accessibility of the professors for her success.